It’s Friday and we could probably all use a little more positivity in our lives, especially on social media. Morten Rand-Hendriksen recently asked his followers on Twitter how WordPress has changed their lives. Here are a couple of the responses that stood out to me. As a beginner web designer, who was struggling to find a job/work, WordPress opened the door to web development and enabled me to offer clients control over their websites. That was nearly 10 years ago and I’ve been building with WP ever since. I graduated in 2008 right into the thick of the recession. No jobs, nothing – the only way I could put food on the table and pay rent was to build WordPress sites for people. This led to my entire career in UX design, and my life would be very very different without WordPress. Here’s one you won’t expect. I was in an agency job I hated. I had an interview with Automattic and failed. Devastated, it forced me to look at what I really wanted. I now have my own consultancy. I’d been working for a hosting company and noticed how many of our users were enjoying it. Decided to go to WordCamp in 2008. The software was great, but the community was what really drew me in. I’ve been using WordPress in my career ever since then. Made a WP website for a friend, then another, then someone who paid me… Today is 6 years and 120 clients later. #WCSEA and specifically @adspedia reminded me that WordPress is about the inspiring people I meet at so many occasions. Beautiful minds & souls who inspired me to build a new and better life 2 years ago. It’s way more than software and individual ego. I started by own consultancy doing WordPress for nonprofits straight out of college. Somehow, I’m still here and still loving it almost a decade later. Meetups and WordCamps (#wcsea!) were so crucial to my learning, developing as a speaker, and networking. There’s always a lot happening in the WordPress ecosystem and every once in awhile, it’s nice to step back to see how this software, which is used by millions of people across the world, is impacting lives. I highly encourage you to read the thread in its entirety. If you’d like to read similar, more in-depth content, check out HeroPress. 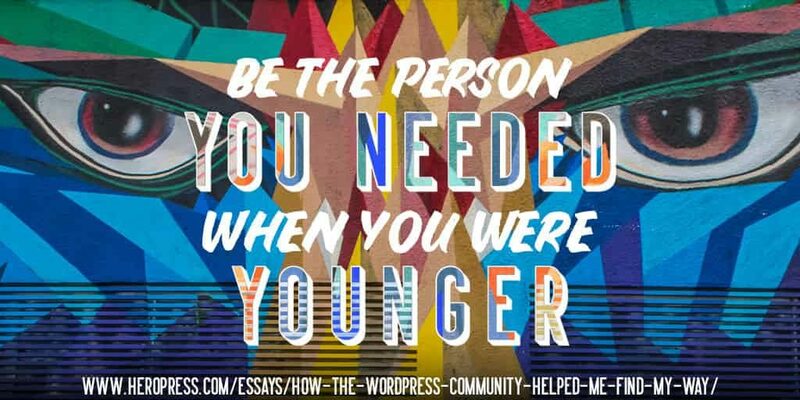 HeroPress publishes inspirational essays from members of the community once a month.